The Wellesley Blue softball team is having a very good week. Rookie Ashtyn Coleman became the first Blue player to be named a NFCA Division III National Player of the Week. The Scottsdale, Ariz., catcher had an on-base percentage of .786 and had a “staggering” 1.500 slugging percentage. She racked up three doubles, two triples and seven walks, and struck out only once out of 26 appearances at the plate. In the season overall, Coleman has a .462 batting average, placing her second in the conference. The Player of the Week distinction is given by the Louisville Slugger/National Fastpitch Coaches Association (NFCA). 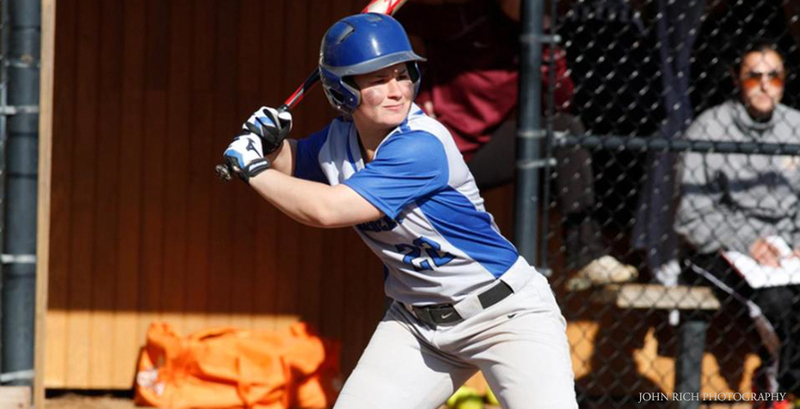 And over the weekend, Wellesley hosted the 2014 NEWMAC Softball Tournament. The Blue entered the three-day tournament as the top-seeded team, and defended their place, beating second-seeded Wheaton College in the winners’ bracket on Sunday afternoon. The team now prepares for Saturday’s 12 p.m. championship game at home with either Smith or Wheaton. On campus? Cheer them on! Thanks to Wellesley Blue Athletic Communications.